Jon Favreau, the director of the upcoming superhero movie Iron Man 2 was asked in a Twitter "Does Iron Man 2 take place before or after Hulk movie?" He said, "Before." This makes no sense, because at the end of Iron Man General Ross talks to Stark about helping him with his "little problem." Although, since they never say what that the problem is, they could change it. I'm betting Jon's pulling our leg. Green Lantern, the galactic superhero with a green power ring, is shaping up to be a unique superhero film. While a few superhero movies had scenes in space, this one is going to be a perfect marriage of science-fiction and comic books. Check out the concept art for "The Guardians", Kilo-wog and more here. Also, if you're into spoilers, they claim to have a copy of the 2008 script. I'm not, so don't wreck my flow in the comments. TOSS-UP: Which would you rather eat at your Superbowl party: Han Solo in Guacamole Carbonite or the 33 ft (10 meter) long "Great Wall of China" made out of chocolate? This week, on January 31st, 1606, Guy Fawkes died for planning to blow up the British Houses of Parliament in the Gunpowder Plot of 1605. His life and death would be the inspiration for the graphic novel V for Vendetta by Alan Moore. The novel was named one of "The Top 100 (English-Language) Comics of the Century" and became a moderately successful motion picture in 2005. This week (February 1, 1893) Thomas A. Edison finishes construction of the first motion picture studio, the Black Maria in West Orange, New Jersey. In 2009, 80 years later, there are over eighty major movie studios worldwide. February 1, 2003 – Space Shuttle Columbia disintegrates during reentry into the Earth's atmosphere, killing all seven astronauts aboard. Its odd that, although separated by twenty years, two major shuttle disasters would occur within two weeks of each other. On February 4, 2004, Facebook, an online site where people can meet and post messages to each other is founded by Mark Zuckerberg. Originally limited to college campuses, it was opened up to the world and has replaced MySpace as the premier social networking site with 1,191,373,339 monthly visits. What do you think of this week's news? Let us know in the comments! 1. ODDSMAKERS hopefully 85% since I'm getting tired of seeing him pulling a Wheres Waldo. 5. TOSS-UP Han solo since after the first two meters I'd get sick of chocolate. 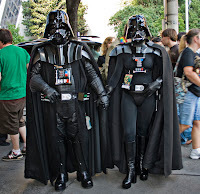 Quote of the Week: In response to the Darth Vader couple, Secondson wrote: "May divorce be with you…"
1. ODDS: 80%. It was cute at first to see Stan Lee pop up, but it's getting old. Literally. Whenever there's a DC movie, they don't trot out some old writer/artist from their comics. Let it go. 2. Never thought it was a good idea. 3. That is odd. I don't know what's going on with that Avengers movie. 4. Scifi superheroes, it's a unique angle. 5. Han Solo in guacamole. Sounds tastier and more geeky. Nothing geeky about the Great Wall.